This review combines a few posts I made back in 2011 about this game into a review. So, the article is part new and part old. 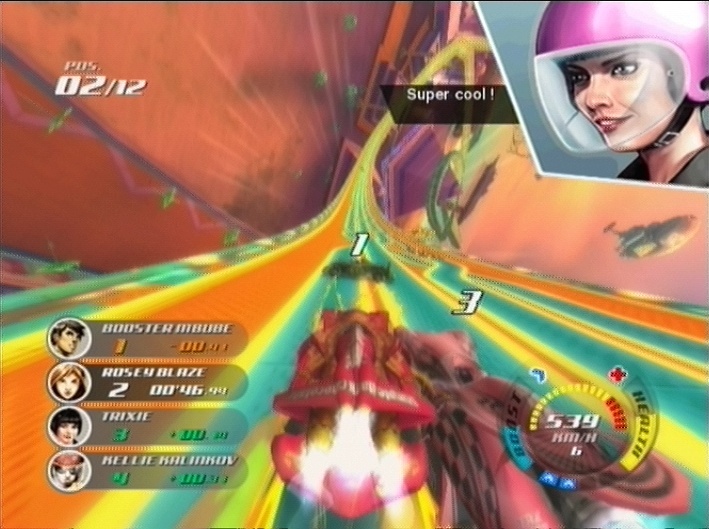 Speed Racer for the Wii/PS2 is a very fun futuristic racing game. It’s great fun stuff, I recommend it! Yes, I know the screenshots are not great quality. They’re as good as I could quickly find online. It’s a fast and colorful game. 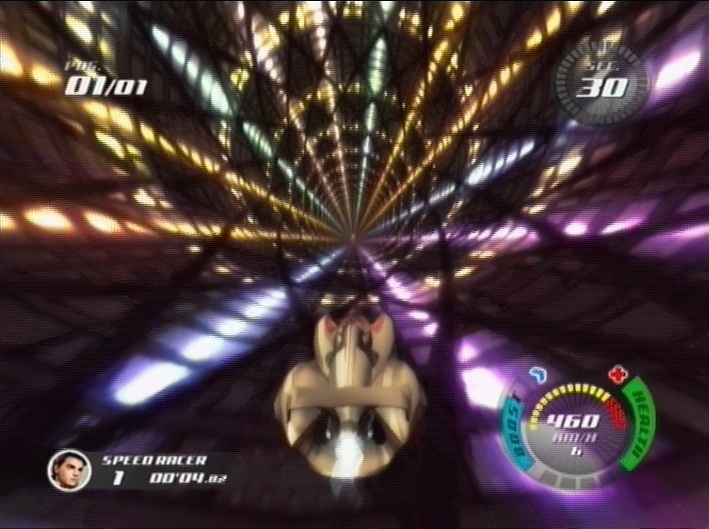 Speed Racer is a futuristic racing game based on the mid ’00s CG movie. Like the movie, this game is under-rated and actually is pretty good, even if not enough people know it. Watch the modern Speed Racer movie, it’s good stuff! As for the game though, this game does not use the plot of either the movie or the original classic anime series. Instead, this is a simple and fun straightforward racing game with no real story. That is fine with me, that’s all a racing game like this needs. The game is fun to play, blazing fast, has a great visual style and nice graphics, even if they aren’t the best on a technical level. On the track, as in the film, tracks are all very colorful, narrow airborne strips of road. The controls are standard motion-based Wii driving controls; they work fairly well, but do have a couple of issues; more later. The game is shiny-looking, fast, and fun to play. Speed is definitely the name of the game here! The cars in Speed Racer are fast, and you have turbo boosts that make you go even faster. When going fast enough the graphics warp in a very cool visual effect. But in terms of gameplay Speed Racer is a simple game, and the selection of options is simple. There is single race, a circuit championship that is the main game, two player splitscreen, and options; that’s about it. There are several different race types, as well, including normal races, long Endurance races, and more. The game has a decent variety of tracks, a good number of cars to choose from, and presents plenty of challenge. However, Speed Racer does have some downsides as well. The major ones are that it is kind of short, has only five environments with three track variants each plus a reverse options, and is a very simplistic game and lacks depth. Also, there are almost no new ideas here — almost everything in this game comes from F-Zero, Mario Kart, Extreme-G, Wipeout, and other major racing games like this. However, even if there are only five track environments, the variants are significantly different, and reverse mode adds a lot as well; the amount of contents is reasonable. And even if the game is simple, it’s also fun. The frustrating catchup-centric AI is harder to excuse away, though, and the simplistic gameplay may not be for everyone. On that note, the only element of memorization in this game is learning boost strip locations. That is important, but it doesn’t even begin to compare to the depth and complex challenge of games like F-Zero or Wipeout, and yes, it is simplistic compared to XGRA too. This is a flaw; I like some depth in these games and miss it here. Speed Racer is fun to play anyway, but it would be better with more depth. I sometimes have felt that I shouldn’t be liking the game because of how simplistic it is, but it’s so much fun that I can’t help it, apart from that frustrating AI. Yes, I do really like this game, but at times the AI can really be aggravating. It’s fortunate that the game looks so nice and is so simple, easy, and fun to play, because otherwise I’d have quit in frustration already I think. But it is indeed fun, so I didn’t. Graphically, the game is high-speed and has flashy visual design. The graphics are very colorful and bright, and have lots of style! The game uses a lot of bright, shiny colors, bright oranges and greens and blues all over… it’s got a great look to it.The visual look helps keep me coming back despite the frustration. 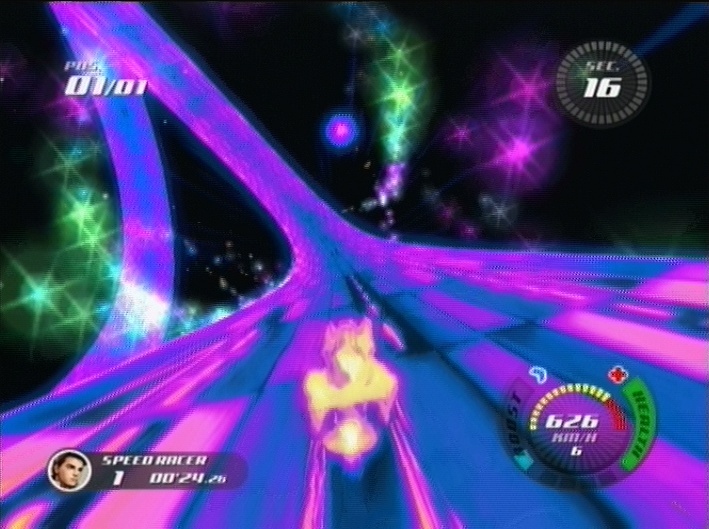 I really like the games’ art design; futuristic racing games rarely try to do tracks as bright and colorful as these are. Dark and dour is much more common in this genre than bright and shiny, but this game breaks that mold. In terms of technical achievement, though, the game is nothing special; they later made a PS2 port of this game, and I can see how it could be done. Speed Racer doesn’t push the Wii to its limits. It does look fairly nice, though. The game sounds good as well. The game has a reasonably good techno music soundtrack that keeps the tempo up. There aren’t enough music tracks, so it repeats a lot, but what’s there is good. I do have one issue with the audio, though: the voices. While racing, the other racers say something to you with a voice quote, with giant on-screen portraits, every single time you pass them, attack them, get attacked, and more. It’s all far too often! A few voice insults here and there, as you see in XGRA, are great and add to the TV or movie feel, but this is kind of broken, the quips are constant! It gets incredibly annoying very, VERY quickly. Fortunately, in the options menu you CAN turn off the portraits, and voices have their own slider in the sound menu, so you can turn off voices by setting the volume for that low without affecting music or sound effects. That is good, and that is exactly what I’ve done — turned off portraits, and turned voice volume quite low so I can barely hear it. Again, if they were infrenquent, as they are in XGRA, it’d be fine, but they’re not, they are incessant and very annoying. Really I’d have preferred an option to keep them, but make them much less frequent, but lacking that, at least you can turn it off. On the track, as in the film tracks are all very colorful, narrow airborne strips of road. As for depth, the only element of memorization in this game is learning boost strip locations. That is important, but it doesn’t even begin to compare to F-Zero or Wipeout, and yes, it looks simplistic compared to XGRA too. This is a flaw, I like some depth in these games and miss it here. It’s fun to play anyway, but it would be better with depth. I sometimes have felt that I shouldn’t be liking the game because of how simplistic it is, but it’s so much fun that I can’t help it… apart from the frustrating, catchup-style AI. Yes, I do really like this game, but at times the AI can really be aggravating. It’s fortunate that the game looks so nice and is so simple, easy, and fun to play, because otherwise I’d have quit in frustration already I think. But it is indeed fun, so I didn’t. You can disable the rider head popups. Returning to the good elements of the game, the game has good controls, for the most part — I like the motion controls for racing games, they work well. As usual on the Wii, you hold the Wiimote sideways, and tilt to turn. In a simple game like this, it mostly works fine. The game has F-Zero X/GX-inspired attacks as well, and they work great with motion controls. There’s a slam (move the Wiimote sideways quickly, as anyone who has played those F-Zero games should expect), a spin (turn the Wiimote in a circle), and a jump (move the Wiimote upwards). The first two of those obviously come straight from F-Zero. Speed Racer is a good game, but it really is lacking in new ideas, and depth as well. The only problem I have with the controls is when you get stopped against a wall. It definitely has the feel that the game is designed for you always to be moving forward, and doesn’t really know what to do when you’re stopped against a wall and need to turn back into the race. It takes an incredibly long time to turn, the speed of the turn is just agonizingly slow. If not for the catchup, one stop of this type would finish you for the race… but saying “this one bad design decision makes this other bad design decision a little less annoying” isn’t exactly strong praise. Still, as long as you are going forward, the controls work well, and the motion-based attacks are great fun. I have no problem with motion controls when they’re done well, and they are here. So, in the game, you zoom along through these airborne paths, trying to avoid enemies and make it through the tracks. When you have enough turbo, boost! Using a boost uses one level of the boost meter in the lower right corner of the screen. You can use boost one block at a time, but saving it up for a long boost late in the race can be a good idea as well. At max boost, as the screenshot above shows, the colors change. It looks really cool, particularly combined with how fast you’re going! Most curves in this game are not hard to get around; there are some obstacles on the tracks you will need to learn, but not too many. As I said earlier, the main memorization element here is just trying to learn the boost strip locations, not memorize the turns. 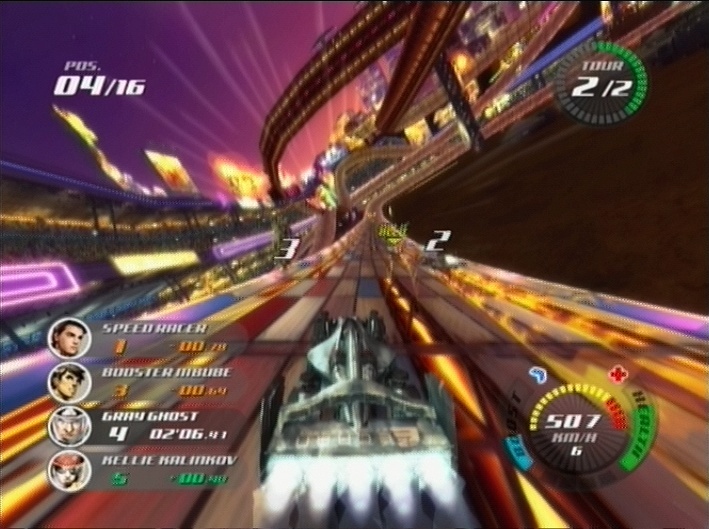 The tracks were clearly designed with motion controls in mind, which helps keep them fun despite the slightly inaccurate nature of tilt-to-turn. Perhaps your toughest obstacle in Speed Racer doesn’t come from the course, though; perhaps the thing that is most frustrating about this game is the opponent AI. In order to keep the game exciting, the developers made it so that computer-controlled vehicles are almost always all in a tight group, battling eachother. This means that the game has crazy amounts of catchup, as the computers always keep close together, right behind you all the time. When you, or anyone else, are destroyed, the car is reset on the track after a short delay. It’s not much of a punishment, not in a game with as much catchup as this one has. Computer cars cheat ridiculously to catch up and pass you. You can never, ever get ahead and get a lead, the whole pack will be right on your tail at all times. I hate this Mario Kart style catchup/”always on your back”-based AI, and it has no place in a futuristic racing game. It isn’t enough to entirely ruin the game, but it does make it very frustrating when you lose a race because of one mistake, or enemy attack, late in the race. This is actually kind of odd, because design-wise this is a simple, easy to pick up, and straightforward game. The designers obviously were trying to make a game with mass-market appeal, because the game has so much less depth and complexity to its design than any F-Zero, Wipeout, or Extreme-G game, to name just a few… but at the same time, the AI they put in to make the game exciting also makes it very annoying at times. This is definitely a double-edged sword, for any market. The simple gameplay will draw people in, but will they stay through the frustration? They should, but I don’t know if they did. In single player series races, the game has a Rival and Ally system. Unfortunately, it’s a pretty pointless system, really. Rivals supposedly attack you more, and Allies won’t attack you and supposedly attack your Rivals, in certain races anyway. Rivals are preset for each character — each one of the racers has specific rivals, and one or two preset allies. However while you can’t add more rivals, you can add more allies. Before each race you’ll get alliance requests which you can accept if you want, to reduce the number of people attacking you. However, try to avoid attacking Allies because it’ll punish you a little, and when you attack an ally you automatically become un-allied. Really the whole system could have been removed without it mattering much at all, it wasn’t implemented that amazingly well. It never felt, to me, like the rivals or allies really mattered. However, the system is there, and might be a little bit of a help once in a while. The AI issues are always present, though. It is very common for the computer to keep running up behind you and attack you from the rear at the last second, dropping you back then places moments before the end of the race. When this happens, as it will far too often, you have no choice but to start the entire eight minute race over again. I do not like the Endurance races for this reason, they are too long for a game like this where luck matters as much as skill does. Other than that though, I quite like it. The game is fun enough to be well worth playing despite the occasional annoyances. The rest of the time, it’s a shiny, fast-paced thrillride! Overall, Speed Racer is definitely flawed, but is a good game. It’s fast, pretty, and fun to play. I am a definite fan of the genre, and think that futuristic cars going hundreds of miles an hour on roads twisting through the sky full of bright neon colors is way cooler and more conceptually interesting than any modern-day car racing game, thematically, but that doesn’t mean all futuristic racing games are good; they definitely aren’t. This one is good, though, despite my complaints. This is a game you need to play to understand, I think. This kind of game is best understood through experience! But yes, I do like Speed Racer quite a bit. It is one of the better racing games on the Wii, no question. It’s fast, usually fun, looks nice, plays well, and makes good use of some of the strengths of the Wii with its solid motion driving controls. I wish that they’d put in more normal AI and maybe had a little more depth, but oh well; what is here is mostly fun. Speed Racer is a good game and gets a solid B score. There is also a PS2 version of the game, which came out months after the Wii one and evidently changed some stuff. I have not played that version myself, though, so I can’t say much about it. I still mean to get it sometime. This video is of someone using an always-full-turbo cheat. Go to 2:05 to see full 4-level turbo boost mode, it changes the colors and looks pretty awesome. This entry was posted in Full Reviews, Modern Games, Nintendo Wii, Reviews and tagged futuristic racing, Racing, Sidhe Interactive, Speed Racer, Wii. Bookmark the permalink.